Well here’s a new iPad app that I never expected to see – WordPerfect X7, a new version of the word processing app and old-time rival of Microsoft Word. This is a free trial, available for a limited time and subject to limited availability. This virtualized desktop companion requires you to be connected to the Internet. During the trial period we recommend you connect to the internet through Wi-Fi for enhanced performance. With WordPerfect X7 iPad Companion, you can experience a full-featured word processor which offers hassle-free, easy-to-use formatting options that help you do more with documents on an iPad. Word Processing essentials on the go! A little bit of an odd way to launch an iPad app, especially hot on the heels of the release of a full-blown version of Word and Microsoft Office for iPad, but likely still of interest for hard-core WordPerfect users. 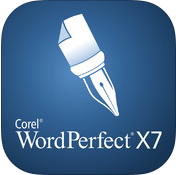 Here’s an App Store link for WordPerfect X7 for iPad. Do we have any WordPerfect or WordPerfect for iPad users here? I would not call the MS Office apps for the iPad “full blown”. And they require an MSO365 account to use in edit mode.